After devoting a large chunk of the past 72 hours to things Girl Scout, I just logged onto a GS alumnae page and set up an account. It asked me what generation girl scout I am, and since my mom was a scout, I put, 2nd. Which means, this little girl? Not only was Friday evening dedicated to me choking back tears while jostling with other parents for the best photo angles, I mean, scouting, but today was all about the scouting as well. 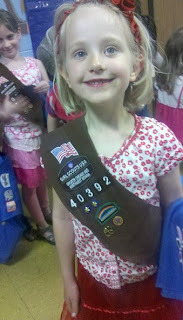 We drove to Wisconsin to visit the Girl Scout Camp that Nutmeg will be attending this summer. Just two nights, but still. My baby is going to CAMP! In my later years of Girl Scout Camp, I went to a session where we went horseback riding, and I made some good friends and we arranged to share a platform tent together the next year, and wrote each other letters. It was a big thing for me, both the riding of horses and the making of friends. So when we pulled into the camp to tour it today, I expected to be flooded with memories. In reality, nothing looked all that familiar. Never mind, I had a wonderful time watching Nutmeg's excitement grow as she made and ate a s'more, visited the cabin where she's be sleeping in bunks, and chatted with some counselors. She'll be going along with her best friend, and I just reveled in the way she held her friend's hand in the beginning and introduced the both of them to the counselor who asked their names. The lodge looked familiar, yet not. I found out that an entire section had been added in recent years, which explained that. Then I went home and started Googling, and I soon realized that this was not the exact same place where my Girl Scout camp had taken place. I had noticed that the names were different, but I thought that it had just been changed because my camp had an Indian name and the mascotization of the Native American stuff is not so popular these days. But on a map, I saw that they are actually two different camps, six miles apart. They're on two different lakes. I found some photos of my camp, which looked much more familiar and brought back more memories. We probably did take a long hike at some point to that lodge, so it makes sense that this would look familiar to me. No matter. To my newly minted Brownie, everything was fresh and new, and she came away bounding with excitement for her return visit. Can you imagine, that my little baby is going away to camp? She's not worried about it at all. And honestly, neither am I. Let the camp games begin! 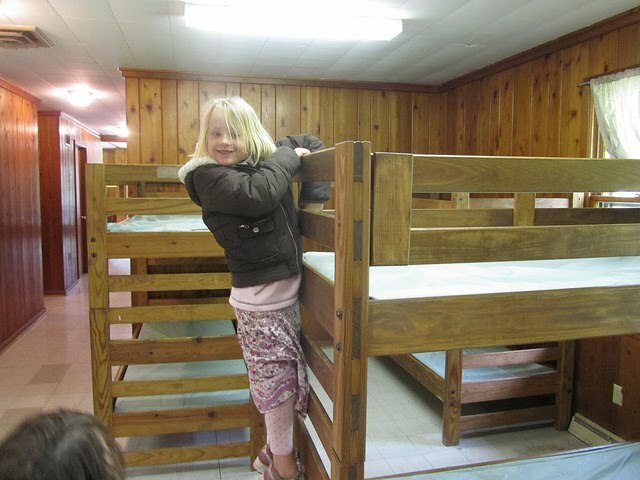 My daughter went to Butternut Springs last year - she was sadly eaten alive in the tents. Do they sleep in the cabins over the summer at JK? Gotta love those Girl Scouts....I know I do. I'm a fifth year leader and lover my girls and all of the fun adventures we have! We had mosquito nets on the beds of our platform tents in our day. I think we had to bring our own net. But Nutmeg will be in a cabin.